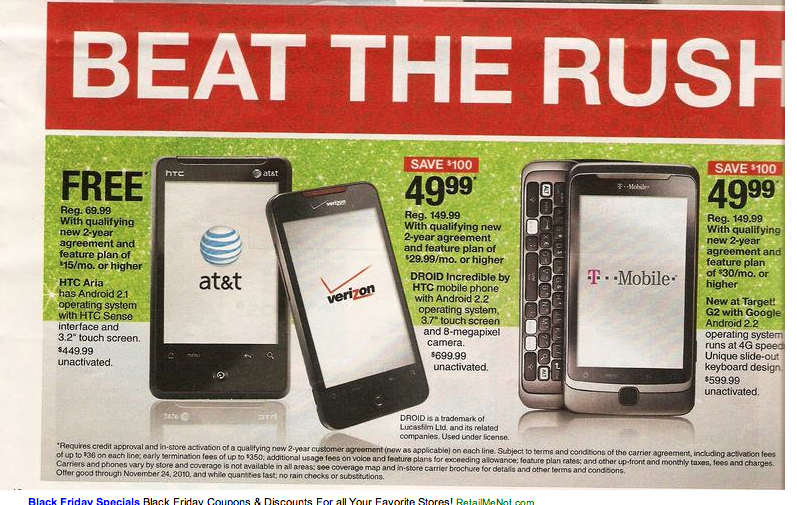 It looks like the T-Mobile partnership with Target is finally paying off, at least if you are looking to grab a new line and a T-Mobile G2 for the low price of $49. Running through November 24th, you can grab a T-Mobile G2 for the aforementioned price of $49.99 with a new 2-year agreement and a $30 data plan. Not a bad deal if you’ve been eyeing one of these and are looking to start up new service or add another line. Not a bad deal at all. ← Dell Venue Pro Delayed, Will Launch With Bigger Fanfare? So glad that I already have T-Mobile service, otherwise all these incredible deals would actually be worth something to me. So is there any deals whatsoever right now for a G2 for someone already on T-Mobile who’s up for upgrade? Would you look at that unactivated price? Highway robbery. Even My Tmobile.com is $100 less! Not in Texas. I have called 3 Austin Targets and visited 2. They only carry the Tmobile prepaid and said they quit carrying Tmobile contract phones. Not a bad deal. Too bad, you have to upgrade to the higher data plans, to get this. I can’t find anyway to find the G2 in an actual store for $49.99. Wirefly/simplexity doesn’t have a way to get that price over the phone. paying off for who?? Def not the stores with no promo. Free AND $15 data plan VS $49 AND $30 data plan……..Tmobile FAIL. Did you check the phone that AT&T offers? HTC Aria vs Tmobile G2. 2 Different phones. No comparison.